Are you searching for the best studio monitors for your home studio? So to make sure you have the best gear for your home studio. The first pair of studio monitors I recommend are the KRK Rokit 8’s. Now these are powered studio monitors, meaning you don’t need an amplifier or any other external power source to use them. And one of the things I like about the Rokits is that they have a really flexible input section. So you have RCA inputs, XLR, and quarter-inch. Meaning you can use these studio monitors with a variety of different interfaces or even plug in your iPhone or something like that to play back music. So they just give you a lot of flexibility on the input side. Now the KRK’s have an eight-inch woofer, which can play back frequencies down to around thirty-five hertz, which is about as low as you’re actually going to need speakers to go. So you don’t need a subwoofer with these, the KRK’s themselves will play back a good amount of bass and they’ll allow you to hear a lot of that detail right at the bottom end of the frequency spectrum in your mixes. Now these speakers are ported, which means they have a hole in the actual cabinet of the speaker that helps reinforce and amplify the low end even further. There are some downsides to using ports on speakers. They can create some resonance, which can cause certain notes in the low end to ring out longer than others. But ports are pretty common, especially on entry-level speakers, and if they’re designed well you don’t have to worry too much about them. 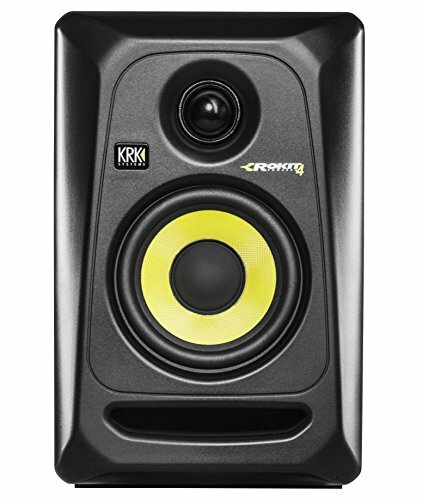 Now the KRK’s are a great entry-level option for people who are just dipping their toes into the music-making process. And again, that eight-inch woofer makes them great because you really don’t need an additional subwoofer to hear what’s going on in the low end of your mixes. You can pick a pair of these up for around five-hundred bucks, and these are very popular studio monitors and there’s usually someone else selling them for a little bit cheaper than that. Now the second pair of studio monitors I recommend are the JBL 308P’s. Now these are also powered just like the KRK’s, so you don’t need an external amplifier or power source to use them. The input section on the JBL’s is not quite as flexible as the KRK’s – so you have XLR and quarter-inch inputs, which will interface with pretty much any audio interface out there, but you don’t have the RCA input. So if you’re looking to plug in your iPhone or a consumer playback device it might be a little bit more complex here. You may need an adapter or something like that. Now the JBL’s also have an eight-inch woofer, which JBL says can play back frequencies down to around forty-five hertz. A little bit higher than the KRK’s, but on a practical level you’re probably not going to hear that much of a difference between these two. Depending on the way these specs are measured, sometimes you can end up with specs that are slightly different, but you’re probably going to hear pretty much the same low-end frequency response on these two speakers. But an important thing to note is that the JBL’s are ported on the back of the speaker, which doesn’t make that much of a difference until you start putting the speakers up against a wall. Let’s say you have the speakers right up against the wall, then you’re going to create some challenges and some issues acoustically potentially by having that port right up against the wall. So if you’re planning on putting your speakers very close to the wall, you may want to go for the KRK’s instead of the JBL’s. Now these speakers have a feature that JBL calls wave-guide technology, and if you look near the tweeter you’ll see that there’s this kind of splaying on the cabinet, so it kind of fans out. And this can help you get a wider sweet spot so you can move your head more to the left and right and still hear an accurate representation of what’s going on in your mix. Now the JBL’s are also a great entry-level solution for music makers. The KRK’s tend to be a little bit more popular so I see them a lot more in studios, but you really can’t go wrong with either of these choices. I think they’re both great, and you can pick these up for around the same price as the KRK’s, so around five-hundred dollars a pair. 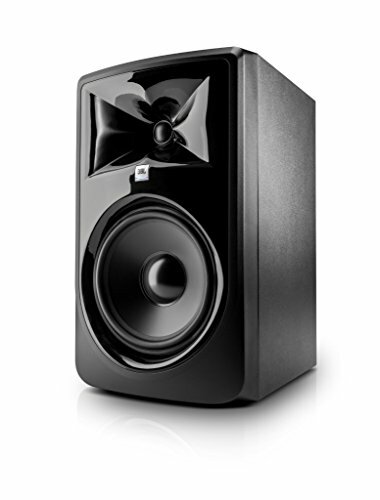 The last pair of studio monitors I recommend are the Focal Alpha 65’s. Now these are also powered studio monitors just like the JBL’s and the KRK’s, so you don’t need an external amp to use them. And the input section on this studio monitor is identical to the JBL So you have the XLR and the quarter-inch inputs, which will cover you for pretty much connecting to any audio interface. Now the Focals have a six-and-a-half-inch woofer, which is a little bit smaller than the eight-inch woofers on the JBL’s or the KRK’s. But don’t be fooled alone by the size of the woofer, because. Focal makes really high-quality speakers, and generally speakers that are engineered well can actually perform comparably in terms of the low end frequency response with a smaller speaker and the low end will actually sound better a lot of the time. Now Focal says that these speakers can play back frequencies down to around forty hertz. So this is about as low as you’re really going to need on a practical level to go to really hear what’s going on in the low end of the frequency spectrum in your mixes. Now I have personal experience with Focal I have a pair of their Solo 6 studio monitors that I use as my main studio monitors. 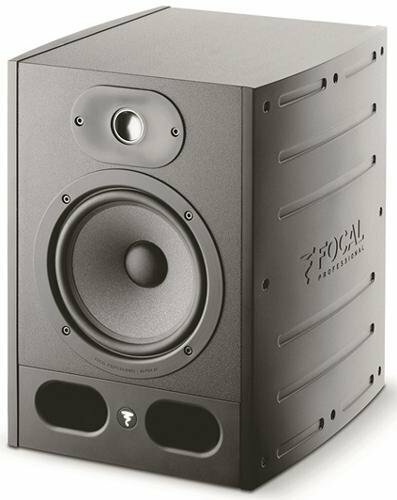 Those are a lot more high-end, but these are a great entry-level or mid-level solution I definitely recommend Focal, I think they’re one of the best studio monitor manufacturers out there. And I think you’ll find that these studio monitors are a cut above the KRK’s and the JBL’s in terms of quality. Now you can pick a pair of these up for around eight-hundred dollars, so they’re a little bit more expensive than the KRK’s or the JBL’s. But you do get what you pay for, and in my experience these are fantastic studio monitors. Focal’s really a cut above the other two manufacturers that I mentioned. So if you’re looking for the best for your studio, I definitely recommend you look into these studio monitors or one of the other studio monitors in the Focal lineup. Again, I use them personally I just think Focal makes fantastic-sounding speakers. Now regardless of which studio monitors you end up with, you want to make sure you’re spending the time and money to both find the right placement for your speakers and your sweet spot in your room, and also invest in some acoustic treatment. Now these two things alone can often make a bigger impact than the actual studio monitors themselves. So you want to make sure that you’re taking the time and spending some money to get this stuff right too.